A human rights lawsuit brought by Colombian families against banana company Chiquita Brands International for allegedly funding and arming known terrorist organizations in Colombia may continue in U.S. federal court, a judge decided today. In 2007, after Chiquita pled guilty to federal criminal charges for illegally funding Colombian paramilitary death squads, victims filed a class-action lawsuit alleging that, in order to maintain its profitable control of banana growing regions, Chiquita abetted the paramilitaries in the commission of numerous human rights abuses. Among the plaintiffs who celebrate today’s victory are the families of community organizers, trade union leaders, social activists, and banana workers who were assassinated in the paramilitaries’ campaign of terrorizing civilians. “We are very pleased with this ruling, and we hope that the U.S. courts do their job so that all the people who were persecuted in the banana-growing region can see justice,” said Jane Doe 8 (a pseudonym), whose father was tortured and decapitated by paramilitaries due to his activities as a union leader. “The court agreed that Chiquita’s alleged actions, in providing financing and arms to brutal death squads, violated international human rights law under the federal Alien Tort Statute, and may constitute crimes against humanity,” said Marco Simons, Legal Director of EarthRights International (ERI), counsel for the plaintiffs. “The plaintiffs look forward to having their claims heard by a jury,” added Agnieszka Fryszman of Cohen Milstein Sellers & Toll, also counsel for the plaintiffs. 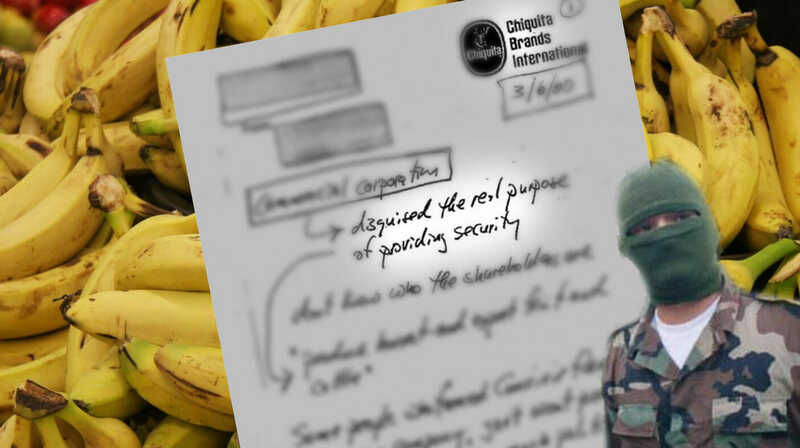 Documents obtained under FOIA and released by the National Security Archive in April demonstrate that Chiquita knowingly paid the paramilitaries to provide beneficial security services for its operations, and then covered up the transactions. In addition to the payments, to which it has confessed, Chiquita is alleged to have helped the paramilitaries ship drugs out and smuggle arms in by giving the armed groups free access to its private port at Turbo, on Colombia’s Caribbean coast. Today’s ruling by Judge Kenneth A. Marra of the U.S. District Court for the Southern District of Florida comes after three years of litigation. The case, Doe v. Chiquita Brands International, No. 08-01916, was originally filed in New Jersey, and was subsequently coordinated with other similar cases as In re Chiquita Brands International Inc. Alien Tort Statute and Shareholder Derivative Litigation in West Palm Beach, Florida. Judge Marra’s decision, which applies to all of the cases, dismisses some of the claims brought by the plaintiffs under New Jersey and Colombia law, but allows human rights claims to proceed under the Alien Tort Statute. Additional counsel for the plaintiffs include Paul Hoffman, Arturo Carrillo, Judith Brown Chomsky, and John DeLeon. The opinion and additional information is available at http://www.earthrights.org/legal/doe-v-chiquita-brands-international and www.cohenmilstein.com; the FOIA documents are at http://www.gwu.edu/~nsarchiv/NSAEBB/NSAEBB340/index.htm. EarthRights International (ERI) is a nonprofit, nongovernmental organization that combines the power of law and the power of people in defense of human rights and the environment. Focusing on earth rights, we work at the intersection of human rights and the environment. We specialize in fact-finding, legal actions against perpetrators of earth rights abuses, training for grassroots and community leaders, and advocacy campaigns that seek to end earth rights abuses and promote and protect earth rights. To learn more, please visit: http://www.earthrights.org. Cohen Milstein Sellers & Toll PLLC has been a pioneer in plaintiff class action lawsuits on behalf of victims of corporate abuses for over 40 years. As one of the premier firms in the country handling major complex class actions, Cohen Milstein, with more than 60 attorneys and offices in Washington, D.C., New York, Philadelphia, and Chicago, has litigated groundbreaking cases that have resulted in landmark decisions on previously untried issues involving price fixing, securities, consumer rights, and civil rights. For more information, please visit: http://www.cohenmilstein.com.